HEIGHT: 12 to 30 feet, has been seen growing up to 40 feet. NATURAL HABITAT AND PREFERRED SITE: Native along the Rio Grande in the Rio Grande Valley, best will adapt to a wide range of soils. It can grow in wet soils but is extremely drought tolerant and will do very well up through the center of Texas. Native from central Texas south to northern South America and west to Arizona, this is a very fast growing, graceful tree for poor soils, with unusual green bark and a long bloom period. It is drought-, heat-, and saline tolerant. It is beautiful but thorny tree and best in spots that are neither too moist nor too dry. With too much moisture, it will seed out aggressively. With too little moisture, it will lose all its leaves. Drought leaf loss is not necessarily an aesthetic problem, though, because chlorophyll production shifts to the trunk and branches, giving them an even brighter green. The word Jerusalem in the common name Jerusalem Thorn does not refer to the Middle Eastern city but is a corruption of the Spanish and Portuguese word girasol, meaning turning toward the sun. 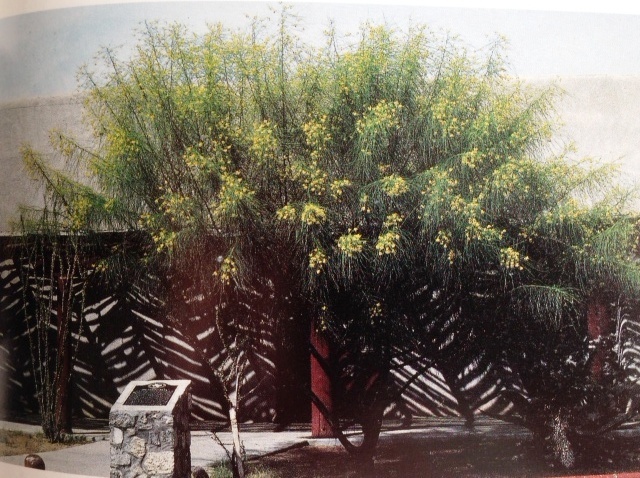 IDENTIFICATION INFORMATION: Graceful, airy tree with long thin compound leaves, yellow summer flowers green bark and heavily armed with thorns. FLOWERS AND FRUIT: Fragrant yellow flowers in the spring or throughout the summer, especially after rains. Racemes are 5 to 6 inches long. The pea-shaped flowers persist for at least a week. Fruits form as slender pods 2 to 4 inches long, constricted between the seeds, brown at maturity. Seeds are green, turning brown at maturity. BARK: Bark is thin, smooth, green, turns reddish brown with small scales on older trunks. FOLIAGE: Leaves are compound with tiny leaflets. Overall leaf is 8 to 16 inches long. Leaflets are only 1/3 of an inch long or less. The leaf mid rib, branches and twigs are green so they also provide photosynthesis. 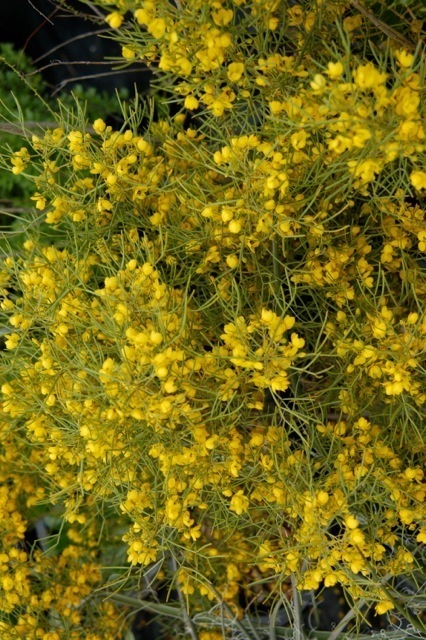 CULTURE: Parkinsonia is easy to grow in a wide range of soils, even high salt conditions. Can grow as far north as Dallas but risks freeze damage there during severe winters. Grows best in the moist, deep soils but is strongly drought tolerant. During drought it shed the small leaflets leaving only the mid ribs of the leaves which are green and can continue to manufacture necessary sugars for survival. Fast growing when young, relatively short lived, tolerates moist soil but doesn’t like sopping, heavy, wet clay soils. PROBLEMS: Freeze damage possibilities in the northern half of the state. Seedlings can become somewhat a problem by sprouting up all over the place. PROPAGATION: Easy to grow from cuttings or seed but acid or physical scarification treatment is needed to aid germination. Physical damage such as filing the seed coat and/or soaking in liquid humate or seaweed can also aid germination. INSIGHT: It is probably risky to invest a lot of money in this plant for use north of Austin. Food - The sweet fruit pulp and seeds are edible. Fodder - Foliage and pods are browsed by livestock. The large, fragrant, golden yellow flowers easily attract bees. Fuel – Sapwood is yellowish and thick, heartwood light or reddish-brown; wood moderately hard and heavy, fine textured, brittle; burns well and is used for firewood and charcoal. Timber - The heavy timber is too small for lumber but is used for light poles and posts. Poison - Leaves have been reported in Paraguay as toxic, at times containing hydrocyanic acid. Medicine - Leaf, fruit and stem decoctions can be taken orally to treat fever, malaria and as an abortifacient. Flower and leaf extractions in alcohol are applied as a poultice to treat rheumatism. Erosion control - As it grows in arid areas and in sandy soils, it can be used to help eroding and sandy soils. Shade or shelter - The heavy branching of P. aculeata makes it a suitable windbreak. Reclamation - Useful for reclamation of wastelands, gullied areas and mining areas. Nitrogen fixing - Although this species is a legume, its nitrogen-fixing ability is not known. Young plants respond to fertilizer. Soil improver - Provides a large amount of leaf litter that is applied as mulch to the soil. Ornamental - Attractive ornamental with unusual foliage, vivid flowers and a smooth, green bark. Boundary or barrier or support - Its browse resistance and stout thorns make it valuable as a live fence for protecting arable fields in arid and semi-arid areas.